First and foremost, we view ourselves as a Herkimer Diamond and green fluorite gemstone company, mining natural crystals from our two properties in New York and New Hampshire. We then turn this gem rough into beautiful faceted gemstones that we set in our own sterling silver and gold designs. While we take great pride in our jewelry designs, what really distinguishes our company from virtually any other jeweler is our use of world class gemstones that we mine and facet ourselves from properties that we own. This vertical integration allows us to control the entire process of jewelry creation from the earth to the customer. We have owned the William Wise Fluorite Mine in Westmoreland, New Hampshire since 1986 and this mine is generally acknowledged to produce the finest green fluorite in the world for color, size and clarity. We then acquired our first Herkimer Diamond mine in Little Falls, New York in 1997. Both mines have produced world class mineral specimens that are on prominent display in the Smithsonian Museum of Natural History in Washington, D. C., New York’s Natural History Museum and Harvard’s Peabody Museum in Cambridge, Massachusetts. 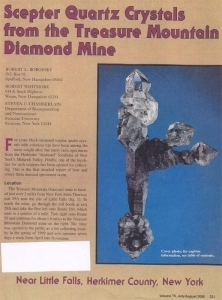 A specimen found by partner Bob Borofsky was featured on the cover of the July/August issue of Rocks & Minerals Magazine in 1990 with an accompanying feature article. 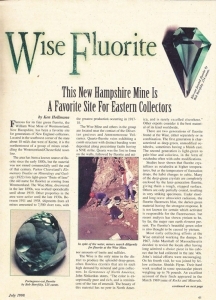 A specimen from our Herkimer mine was also featured on the cover of the July/August issue of the same magazine in the year 2000. The cover article in that magazine was written by Bob Borofsky. Bob also teaches a geology and mining class at Keene State College (part of the University of New Hampshire system) in the winter and is a recognized expert in the field. Herkimer Diamonds are by far and away our most popular gemstone. We now own 160 acres of crystal bearing property in Fonda, New York, having sold our property in Little Falls, New York several years ago. We always mine in an ecologically sound manner and both of our United States mines are, of course, conflict free. We have over 20 years of faceting experience, with our own faceted stones on display along with our natural specimens in the museums mentioned earlier. Our faceting expertise allows us to produce only stones of the very finest quality out of the best gem rough available anywhere. As mine owners, we control the source and never sell the gem rough. For all these reasons, we are the best source anywhere for genuine faceted Herkimer Diamonds. Our company is unique. We actually mine the gemstones ourselves on property that we own, facet them in our shop in New Hampshire, then design and make the gold and silver jewelry that we sell directly to our customers. 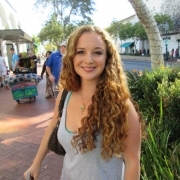 Jennifer is the design artist and co-owner of Green Gem Company. She integrates an intimate knowledge of gemstones with inspired designs. Jennifer has been passionate about gemstones & jewelry since she found her first amethyst while hiking with her family in the White Mountains of New Hampshire, at the tender age of five. A lovely pendant was crafted and Jen still cherishes this necklace. She attended the Danforth Museum School, studied jewelry design and opened a gallery. Jennifer specializes in custom designs. Robert has had a life long attraction to the world of mineralogy. What started as an interest collecting rocks and minerals eventually led to the purchase of two mines. In the early 1990’s, Bob began to facet green fluorite gems from the Wise Mine and set them in gold for friends and family. The appeal and demand for these gems soon attracted attention in the press and resulted in the creation of the Green Gem Company as a commercial outlet to the public for unique, high quality gemstones from the region. 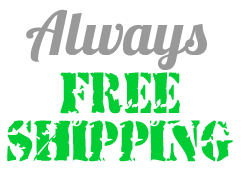 Green Gem Company very proudly mines & cuts most of our stones from our very own mines located in New Hampshire and New York. We are constantly looking for other gemstone sources in the New England and New York area. There are wonderful locations for quartz (clear, smoky and amethyst), beryls (aquamarine and heliodor), garnets and tourmaline. 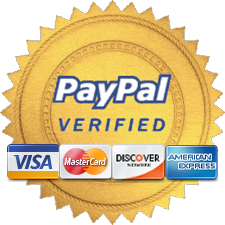 Please contact us should you want more information on gemstones that may not be pictured on our website. Herkimer Diamonds are very clear & pure double-terminated quartz crystals that are found only in upstate New York. These gemstones were named Herkimer diamond due to the fact that the first crystals were found in Herkimer county and had the raw appearance of diamond. Herkimer diamonds are a wonderful, inexpensive, naturally occurring conflict free alternative to traditional diamonds. They are truly hard to distinguish from a diamond as they are very hard, durable, and can scratch steel and glass. Herkimer diamonds will give you and yours a lifetime of enjoyment! TheTreasure Mountain Diamond Mine is a world famous location for beautiful sceptered Herkimer Diamonds, black stemmed quartz crystals with clear Herkimer Diamonds perched on top. It was featured on the July/August 2000 cover of Rocks and Minerals Magazine. The mine is situated on over 200 acres of scenic rolling hills in Little Falls, New York. The purest quartz in the world is found in pockets contained within 500 million year old dolostone on the property. These water clear crystals are then faceted into the brilliant gemstones that become the focus of our beautiful silver and gold jewelry. We also recently purchased 150 acres of crystal bearing property overlooking the Mohawk River in Fonda, New York. The land goes from the river valley 200 feet above sea level all the way up to 1000 feet and encompasses multiple layers of crystal bearing ancient dolostone. We are finding rare and fabulous skeletal smoky Herkimers in addition to the classic clear Herkimer Diamonds. Gemstones faceted from these smoky colored crystals are a beautiful and unrivaled addition to our line of Herkimer Diamond jewelry. The entire property is forested with oak and sugar maple trees, occasionally allowing 50 mile views across the river valley to the hills beyond. Simply put, this is one of the most beautiful gemstones found on Earth. Specimens from our mine are prominently displayed at the Smithsonian in Washington, D.C., the Peabody Museum at Harvard University, the Museum of Natural History in Houston, TX and the Museum of Natural History in New York City. Click on photos to read more about our mines in these articles from Rock & Gem Magazine. For best results, use a soft toothbrush and luke-warm water to clean your Herkimer diamond & gemstone jewelry. Rinse your piece. Put a small amount of dish-washing liquid or hand soap on the toothbrush. Rub every surface of the stone thoroughly with the toothbrush. It is important to brush the bottom of the stone as well as the sides and top. Make sure to work your way through all the little openings in your piece to reach every surface of your gem. Rinse thoroughly with clean water. 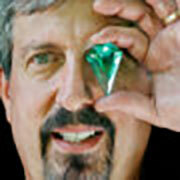 Your Green Gem piece will shine like new. Repeat this process as often as needed.